In practice, shop owners often want to limit the display of Payment Method based on multiple criteria such as Customer group, Cart condition, product attribute, time limit, or the compatibility with sales rule. Thanks to Mageplaza Payment Restriction extension, you will be able to achieve this and fully control the use of in-store payment methods and improve efficiency. This extension is totally compatible with Mageplaza One Step Checkout. From the Admin Panel, go to Sales > Payment Restriction > Configuration, choose General Configuration section. 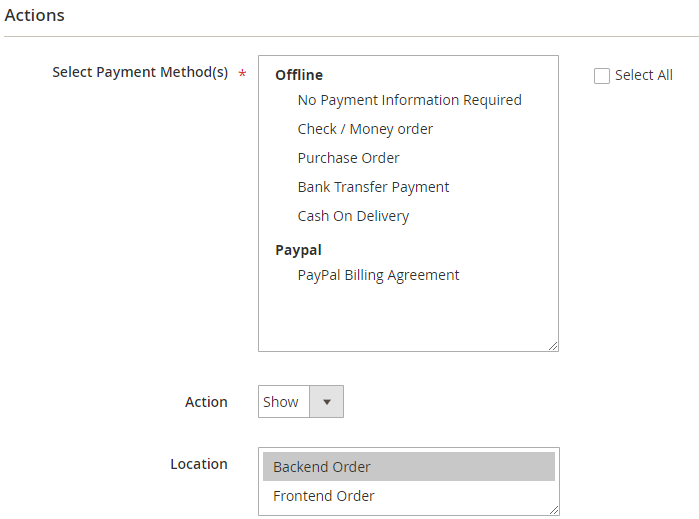 From the Admin Panel, go to Sales > Payment Restriction > Manage Rules. 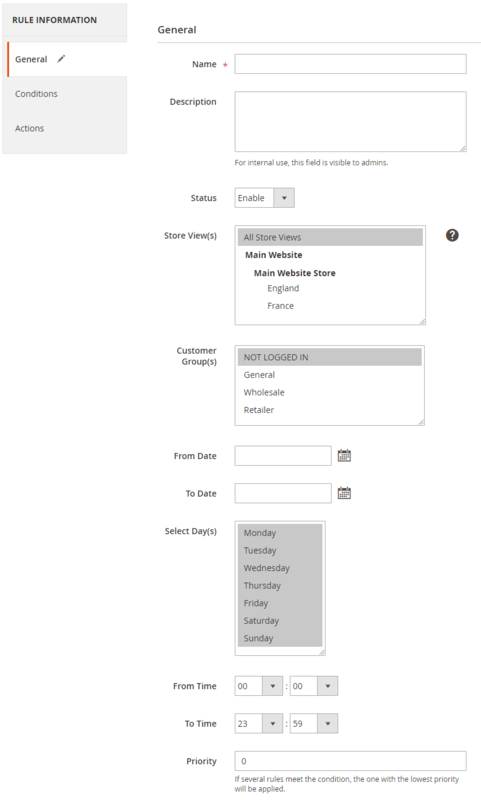 Choose Store view, rules will be redirected to display on the selected store. Only apply the rule for the products on the selected stores. From: Click on Calendar box to choose date/month/year. The rule will start from date/month/year you have chosen. Select the hours of the day to start applying the rule. For countries located in different time zones, they will be applied according to the hours configured for those countries. For example, Viet Nam is in GMT +7, America is in GMT -5. Time from is 8.00 AM, then 8.00 AM in Viet Nam and 8.00 AM in America will start applying the rule when customers purchase. Choose the hours of the day. The rule will finish diplaying at the time you have chosen. For countries located in different time zones, they will be applied according to the hours configured for those countries. For example, Viet Nam is in GMT +7, America is in GMT -5. Time To is 6.00 PM, then 6.00 PM in Viet Nam and 6.00 PM in America will not apply the rule when customers purchase. The smaller the number of the rule priority, the higher priority. O is the highest priority. Select created the rule in the Cart Price Rules to activate the rule for Payment. Multiple rules can be selected at the same time. If customers use a coupon or purchase and satisfy the condition of the selected rule in the Cart Price Rules, this rule will be applied to the Payment without checking the applicable conditions of the selection above. 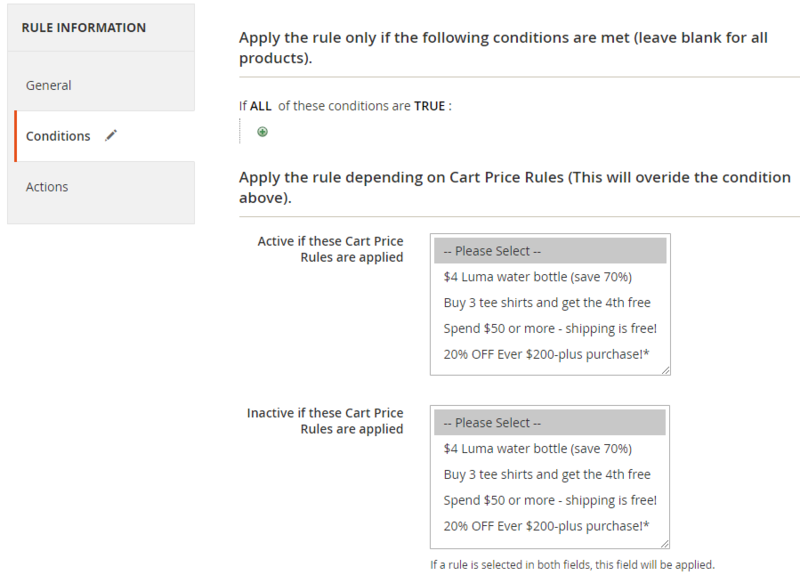 Choose the created rule in the Cart Price Rules to activate the rule for Payment. If customers use a coupon or purchase and satisfy the condition of the selected rule in the Cart Price Rules, this rule will not be applied to the Payment Restriction without checking the applicable conditions of the selection above. If one or more rules is selected at the same time in the both Active if Cart Price Rules applied and Inactive if Cart Price Rules applied fields, then in the Inactive if Cart Price Rules field, the rule that is applied for Payment will be checked based on the feature of Inactive if Cart Price Rules applied field.